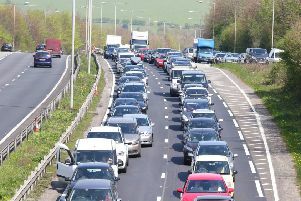 The road has now been cleared following a two car collision on the A27 Upper Brighton Road in Worthing this afternoon. The collision occurred on the A27 Upper Brighton Road Westbound at Cissbury Road, partially blocking the road. Police confirmed two cars were involved but said there had been no injuries.